After few days of being netless I thought atleast now I will post my Swedish Cinnabuns which were baked for We Knead to Bake #11. 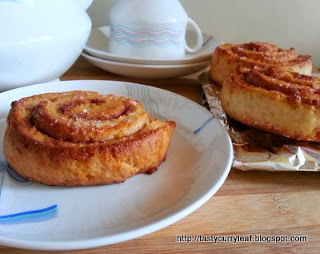 I love cinnamon rolls and never leave a chance to bake them. I have tried several versions and definitely loved the Swedish version also. As I was in a hurry I didn't attempt the different shape suggested by dear Aparna and went with the normal/common shape. 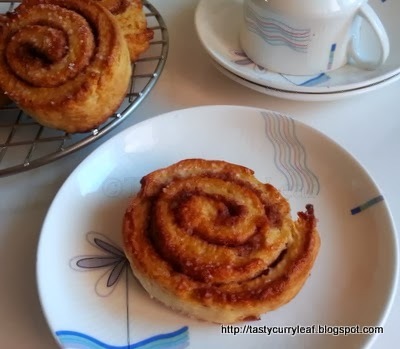 Kanel Snegle or Cinnamon Snails/Swirls or Kanelbullar Cinnamon Buns are the Swedish version of the popular cinnamon rolls. In fact it is the original version and the Swedes make it with a little twist and less sugar and its perfect as an anytime snack . October 4th every year is celebrated as Kanelbullar day in Sweden. Mix together all the starter ingredients in a big bowl to get a more or less sticky dough. Place this in a greased bowl and chill overnight in the fridge loosely wrapped in plastic. The dough might rise a bit even though it is placed in the fridge. Mine didn't may be because I tightly wrapped it!? The next day keep the starter bowl outside for atleast 30 minutes or until it reaches room temperature. Tear the starter dough into pieces and add to the food processor bowl along with flour, cardamom, sugar,salt and lemon zest/peel. Blend to mix well and then add in soft butter and knead well to get a smooth and elastic dough. If the dough is dry add in more milk - I did add extra 2 tbsp - or if sticky/moist add more flour to get the correct dough consistency. Turn out the dough onto a lightly dusted surface and roll it out into a 20" x 12" rectangle . Cream together the filling ingredients except the almond powder with a fork/whisk/spoon to make a spreadable filling. Spread this filling all over the dough rectangle if you plan for the normal/common shape.Sprinkle the almond powder atop the filling. Roll the dough tightly in jelly roll style and into 20 equal pieces with a sharp knife.Place the pieces cut side down on a lightly greased baking sheet leaving space between them . Let these rise for about 10-15 minutes till they look puffy but not swollen up. Meanwhile preheat the oven at 200C/ 400F. Brush the swirls with milk and sprinkle with sugar crystals. Bake them for about 15 minutes till they are golden brown and sound hollow when tapped. If browning too quickly , reduce the temperature by 20C/65F and bake till done. Take out and after 5 minutes on the baking sheet turn these onto the wire rack to cool completely. You can serve these warm or at room temperature anytime especially tea/breakfast time. You can even freeze these for later use. Now lets see how others did their cinnamon snails . 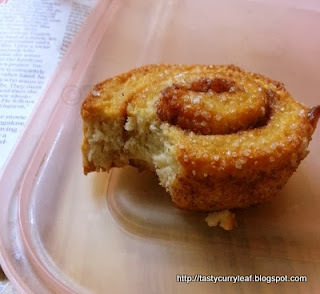 Hop over to Aparna's post.Let me finish my last one.